Hi everyone. This week was brutal - I worked on the new house for 5 out of 7 days. Though I was able to find quite a few goodies at the thrifts on Friday, I just don't have time to list them all out. So I'll just post one group picture of a few of them, and hopefully we'll add the neglected things to next week's post. 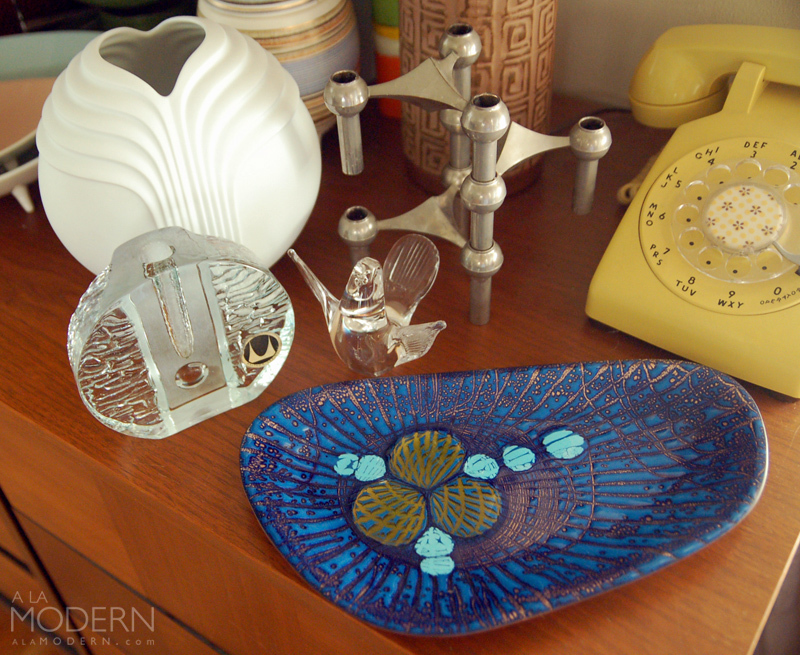 You may or may not know the artist behind the fantastic midcentury blue enamel plate in front. I grabbed it the instant I saw it - causing two nearby thrifters to look at me strangely. =) This is by Annemarie Davidson, a well-known enamelist who produced in Sierra Madre up until quite recently (if I'm not mistaken well into the 90s). We find a lot of her stuff since she lived so close by to our area. I usually find round plates or bowls in this pattern - have never come across a freeform style. She also made a host of different enamels with animals on it - while I like them a lot, they aren't worth as much in general. It's the geometric forms that command the higher prices. The little glass bird (hummingbird?) came from an estate sale - the lady collected a lot of different glass animals, but this was the only one with a "Made in Sweden" sticker. I thought it might be by FM Konstglas (Marcolin) - but it turns out it's made by Reijmyre. I'm not very familiar with the company, but believe they're still producing glass objects. The curious glass candleholder to the left of the bird has a sticker that says "Walther Design". I think this is a German company and that it was probably designed in the 1960s. I haven't had time to research this further - if anyone knows the designer on it, would appreciate if you could let me know. The white bisque op-art vase is from Rosenthal's Studio Line. They made a host of different vases like this. I believe this one is designed by Rosemunde Nairac and came in two different sizes (12cm and 18cm). These vases are a great pickup, because they do have value, even though they're often priced very cheaply at thrifts or estates. Lastly, I found these three Nagel stacking candleholders. To be honest, I didn't think they were special at first glance and they were unmarked. I have to thank the #thriftbreak twitterers for this one (vintagedamage and sllabstudios), because they let me know that these are collectible. I actually had just left the thrift before I got a message about them, so I turned around and went back to grab them! OK, as I said, we'll try post the remainder of the finds next week. Happy thrifting!